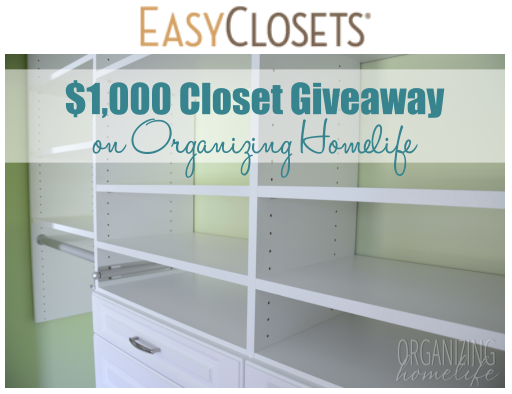 EasyClosets $1,000 Organized Closet Giveaway! 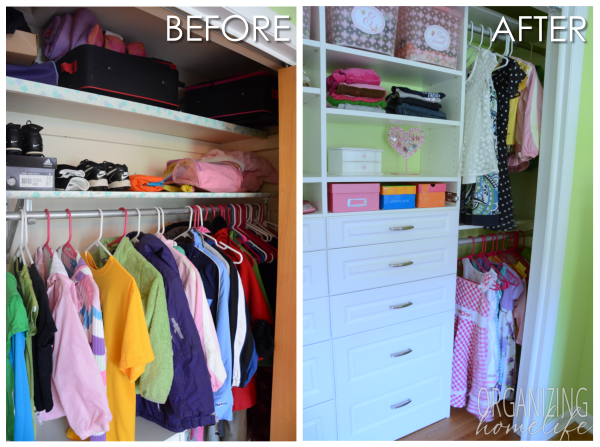 Have you seen the amazing transformation that happened in my girls’ room closet? Thanks to EasyClosets, it went from an ugly, outdated, and disorganized closet to a beautifully organized space that will grow with us over the years. I am SO thrilled to tell you that one of YOU will have an opportunity to win a $1,000 closet makeover from EasyClosets!!! Woo hoo! A number of you have asked about the price of the unit we installed. EasyClosets are completely customizable. I chose not to throw out a number because the price is entirely dependent on the closet you build and your specific design choices based on your dimensions. The closet in my girls’ room is a fairly large reach-in style closet and I upgraded it with raised panel drawers and fancier hardware. When I worked on the design, I wanted a lot of drawers, essentially replacing the cost of buying a dresser, so another closet without the upgrades or the number of drawers that I chose could be vastly different in price. Here is a recreation of the closet I chose. With the flat style drawer fronts and chrome hardware, it would cost just over $1,300. Not too bad in my opinion for the superior quality of these closets and considering how much a dresser with that many drawers would cost by itself. If I upgraded the drawers and hardware (which I did), the price would be about $270 more. I know a lot of you would like a nice closet for yourself (not for children), so I want to show you a few options that have more hanging space than I chose for my girls. Check out the design with the exact same dimensions using less drawers and adding more hanging space and shoe shelves. This is what I LOVE about EasyClosets! I can very easily change the design we have now to this design when our girls are older if they need more hanging space. This is why EasyClosets grows with you. Nice, right? My closet is smaller than the closet in my girls’ room. If I was designing a closet for myself, I might choose a design like this. Do you see the price??? I can’t talk enough about the quality. It is exceptional. For $441, to have an organized closet like this? That’s barely the cost of buying a dresser! I would highly encourage you to enter the dimensions of your closet and check out the design capabilities of the EasyClosets online design tool. It will give you an instant quote as you work through the design process. Need help with ideas? Just give them a call and work with one of their fantastic designers (for free). So how would you like to win a $1,000 closet makeover from EasyClosets? Simply leave me a comment telling me what you like best about EasyClosets and what closet you will makeover if you win. That’s in and you’re entered! One winner will be chosen randomly using Random.org to receive a closet organizing solution from EasyClosets.com valued at up to $1,000. Product will be shipped to the winner by EasyClosets and installed by the winner. Giveaway begins Tuesday, May 27, 2014 and ends Monday, June 2, 2014 at 11:59 p.m. EST. Winner will be e-mailed and announced here on Tuesday, June 3, 2014. Looks like a neat way to customize every closet for its own purpose. Love that it appears to be reasonably priced, for every budget. After 20 years in this house, we have redone both girls rooms and closets a few times. Watch out! This year I am tackling the master bedroom and of course that means my 4×6 closet and my husbands 4×6 closet. It may not be much of closet space but they are almost all ours (paid off in 4 years) . I need to get as much storage and clothing space I can possibly get , since we only have 4 closets in our house! (Previous owners put the a/c in the hallway closet). I love the online design tool! It is so helpful. I would love to organize our master closet. It is tight for all of our stuff but lots of wasted space right now. This would be the perfect solution! I would definitely make over my 2 daughters’ shared closet. I would love to get the Master Bedroom closets organized! I would love this for my closet…… old hardware, old style and needs a new facelift. Nice job on the girls’ closet. I like the fact you can customize any closet you want. The build ins can replace pieces of furniture too. I would do my sons closet. His too is a reach in and could be organized better. I love this, and would do my own closets! I would love to do the closet in our bedroom. We live in a small house with very little storage. We only have a reach-in closet and, at this moment, it’s not very organized. How wonderful! A place for everything and everything has a place! You get mom of the year! Well we have lived in this house for 15 years and a promise was made by my husband to fix our bedroom closet as it is so small.. it has never happened. I still dream of it.. but feel as time passes that maybe the old folks home that I will end up in will have a better closet…. I love the new closet!!! I would do my girls closet! I love the way it can be personalized and it just makes me want to reorganize all my closets! My favorite thing about the closet is that it moves and grows or shrinks with you. I would redo my closet bc there isn’t enough defined space. It’s just pretty open (it’s not that big so saying open sounds funny. Heheh). I would love to be the organized person I feel is inside of me screaming to get out!! I love the drawers. They look so clean! I would do over the closet I share with my husban if I won. I love how its so customozable for different needs. We have a large front door closet that I would like to make into more of a mudroom space. This would be an amazing product to do that. I love the extra drawer space in the closet! My kids are sharing a room and each have a dresser but could each uses 2nd! I would definitely redo their closet! I love this closet system! It looks so easy to install and I love the online design tool. Our master bedroom closet is such a strange area I would love to get it organized better!!! I love your recent picture on your closet organization. Something like this would help us tremendously with storage in our house. We have two small closets and a walk in master (which is where a lot gets stored)! To do something like this in our master would help us store better as our house is 1400 sq feet with zero storage. Trying to find a spot for everything is hard and it is driving me nuts! This would be great for my home! We bought our home last year but unfortunately, it does not have a lot of storage. One of the guest rooms is small and we can barely fit a queen size bed and a dresser in there therefore this is where the closet would be. It would also serve as storage for my daughters board games that are laying on the game room floor because we have no storage there……yet. I would love to have one of these…….the closet is exactly like your daughters and I would love to have that storage. Thank you. How neat! Would love to have these for my daughter and for myself. Love that I can build it to fit my long dresses and my husbands work clothes. We have a larger closet, so th variations would be helpful in planning! Would love to win! I have never been very adept at making a closet organized. I think the online tool is awesome and would redo my master closet if I win! My husband and I have separate walkin closets in our bedroom. I would love to makeover both closets to fit what each of us need. My 10-yr-old has a small room. This would be great to expand her space! I love that they incorporate drawers right into the closet. I would redo my master bedroom closet! I live in a very old house with few closets. After being married for 40 years I am trying to thin things out. I LOVE the multiple choices of arrangements in the Easy Closets system. I have never had a closet system – only a rod and shelf – in our ‘master’ closet. Thank you so much for the opportunity. This would be great for our master closet. I am obsessively organized and hate dysfunction but no matter what I do I can’t seem to get that closet put together cleanly. I hate walking into my closet every morning. I love how customizable everything is. I would love do make over the master closet or our sons walk in closet. I love the organized look and the simplicity of the tools to pick your own design. I have a bedroom closet I would love to organize. I am in dyer need of a closet make over!! With not a ton of room there are shoes and clothes shoved everywhere…. I love the way you closet looks simple and organized!!! Hope I’m the winner!! Space saving and convenience would be so nice in our master closets. I’d love to organize work vs everyday clothes for my husband and myself. This would be perfect. I would makeover my closet! I love that it’s adjustable to fit your needs! My old house had all the closets remodeled and my life was so much more organized! Since relocating I gave struggled with my closet space but an upgrade was never in the budget! This would be a fun project for the house. I think I would start with my girls closet! I love the online design tool. I would fix up my son’s closet, it needs help! Love this- trying to organize the entire house but such a big job- I think I’ll start with my son’s closet so hopefully I can walk thru his room again! I absolutely love your closet!! These closets seem so nice and obviously keep things very organized – which is so important in my life!! I would love to win a closet and be able to organize my 2 year old’s closet! He needs a new dresser and this would be like 2 in 1!! Thank you for your contest!! I love how customizable these closet systems are, how they make the most efficient use of space, and how beautiful they are! We just moved and our new master bedroom closet has only the most basic wire shelves, so we would love a new system! Thank you so much for offering this contest! Since more than half our home was destroyed in Hurricane Sandy and out contractor never came back to complete the job. He was paid thru organizations directly. And trying to locate him to get the job completed has been fruitless. I’m a single mom with 10 kids trying to keep things together myself. So having a closet organized in any room will be a huge and amazing gift. Love this! My girls need the same closet makeover and would love the win it for them. It looks like so many customizeable spaces for all their accessories. Thanks for sharing ! I would tackle master bedroom closet. It is the only closet left that has not been redone since bought the house. I love that everything is customizable to fit my needs. I love the design tool, I’m excited to measure my own closet and try it out! I love the customization options. Everyone needs something different and that makes it possible! We would redo our master; it’s barely larger than a reach in and not quite a walk-in. With our room also being small it would be nice to eliminate the need for a dresser! I love how easy installation looked from your pics. I could do that! Loved the design tool and the rail hanging system of this closet. I’m an avid DIY fan and this product seems very easy to install. I would do both of my bedroom closets!! 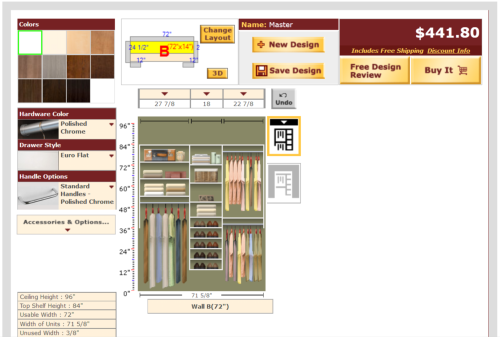 I love the online design tool…it should help me design the master bedroom closet quite nicely! I love the different options. I can have my side of the closet and my husbands set up they way we want it. With 4 children in 2 bedrooms, we are always in need of more closet space. I love how EasyClosets help to make the most of limited closet space. I would use the remodel for my older boys bedroom. I have been debating adding a dresser in the closet bc we are so limited with space in the room. This would be the perfect solution! I absolutely love your closet! I would love to organize my closet! Although I think I would be tempted to use the closet for my scrapbook room! I would use more drawers in my layout! I am a folder not a hanger! Oh wow… I love it!! I am an organizer… I LOVE everything organized! We are in an old house with VERY LITTLE closet space!! I love the combination of drawers, shelves and hanging space in your closet!! I would love to organize our closet in the maters bedroom! Since we’ve been married our house has grown with the number of bedrooms (and we’ve added three kiddos) and our closet space has shrunk a ton!!! We started with two large walk in closets in the master bedroom, then we transitioned to one walk in closet… And now we have a tiny, sliding door closet with one hanging rack and one shelf… Eek! We are truly blessed and love our home…with all that said, our closets could definitely use some work!! 🙂 Thank you for offering this giveaway!! Beautiful! I love that you can easily customize the closet! My husband and I recently moved and our closet is substantially smaller so I would definitely use this in our bedroom closet. We bought our house 2 years ago and have remodeled most of the house with the exception of our sons room. His was the most usable during renovations (we took the house back to framing and started over). Now that the rest of the house is mostly done we are ready to tackle the closets! Our son was such a trooper as he watched his sisters (larger) room go from ick to a princess paradise we have decided to start with his closet! 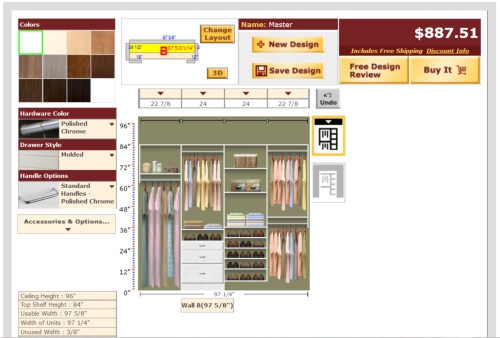 I love that Easyclosets has an online design tool so he can help customize his closet. He’s the one that needs to use it! He’s turning 10 in a few months and has been a huge help throughout our massive renovation project and we would love to show him how much we appreciate his help with an new “tricked out” closet! I love that you can customize this to get exactly what you need. I would love to organize my master bedroom closet. I love the value for the money and easy assembly! Would love to do the master closet, it is huge but there is a ton of wasted space right now! OMG I love the powerhouse of organization going on in this closet. It is perfect for sharing at different ages. If I were to redo a closet it would absolutely be my daughters since she will be sharing soon with her newborn baby brother. Having a place for all of her toys and shoes as well the baby’s would be divine. Love that it looks so easy to use! I would make over my daughter’s messy closet! I love you can customize for your personal needs and I would organize the kids clothes/toys closet. I could really use some help there. I really appreciate the versatility of each design. Even my 2 year old could keep it organized. I will upgrade my daughter’s/son’s closet if I win. I like how everything is so easy to find and accessible for all ages, my husband and I have custody of our 6 and 9 year old nieces they share a room and this would be perfect for the them both to be able to get to their thing’s without the room getting messy each time. Oh my gosh…I would love to have an organized closet! I would definitely makeover my closet. As of right now my husband tshirt obsession has taken over our closet. I would love to actually put some of my clothes in there! I would LOVE a closet makeover! So many closets, which one would I do…?! My girls also share a room and closet. At 10 and 12 they are in the ” that’s mine!” stage, and an organized closet would be a great peace keeper! This would be amazing for my 4 girls sharing a room! I love the flexibility you have for designing what fits your needs. Love how customizable the closets are and how user friendly their site is. And very reasonably priced! We’ve had quotes from other companies and could never justify spending thousands of dollars on any of our closets. EasyClosets sounds like the perfect solution! I love the simple organization that can be used in small closets also!! We have an older home with extremely small closets so I would use it for our master bedroom so my husbands clothes don’t have to be hanging in our sons closet across the hall!!! This would be wonderful for my daughter’s room! She has a lot of clothes, thanks to older cousins and needs a functioning closet that will help keep her organized. I love the many options that would also eliminate the need for a dresser as well, giving her space on her room for a desk and chair…a must as she becomes a teenager. Thank you gorgeous the opportunity! I like how you can make a “home” for everything. My boys share a room so I would want to redo their closet. I have looking for some ideas for about 4 years now. I really like how this is very organized. There is a place for everything. I am wanting to redo the three closets in my home. Mine is the largest and I need to be able to used the whole space. The other two closets are in my girl’s rooms. They are 13 and 7 and they both are different with what they have in their closets. I also really like the online tools to help design these closets. Love it! I love that everything is interchangeable and that the price is so affordable! The timing couldn’t be more perfect for me to see your post. This fall we will be making our teeny tiny master bathroom larger, which means making our large master bedroom smaller in our 1850’s built home. Our existing closet will become part of the bathroom, so a new closet will be made. How wonderful it would be to have an organized closet as those pictured. I’m hoping I win, but if not I will know where to go for my closet woes. I have an interior design degree but never got to actually work in the field. i LOVE organizing!!!! I have been in my house for almost 2 years now and still do npt have shelves in any closet :(. I would love to at least get shelves in my children’s closets. I have a huge 13 x 5 master closet but my children are more important than me. I have literally been “living”out of a laundry basket for about 5 years so i can deal with no shelves for me but my children could use their space so much better with shelving. Being a stay at hime mom with 2 small children it is hard to find extra money just lying around for closet shelving. The EasyCloset solutions would work perfect to customize each closet to suit each person’s needs. Many great usable options! My girls’ room needs this so badly! It’s a very small room but a big reach in closet. I daydream about my closets being this organized. **sigh** I love that there are so many different options with EasyClosets. Wow! Clean, simple, beautiful and durable. What more could you want? The organization brings such a sense of peace. I love the functionality, organization and look!!!!! I LOVE that everything has its place! You know how it has that “feel good” when you look at it. Organization can bring about peace and calm instead of chaos! The closet new looks like an extension of the bedroom so it is like you just gained more square footage. What a great way to teach your children that picking up and putting things away can be fun,, easy and look good too! We are blessed to live in a house with many closets – unfortunately we have little ones so to keep them safe and us sane – we have to keep most things downstairs in our master closet which has become a massive catch-all for everything any anything: nail polish, meds, sentimental memories we don’t want yet destroyed by little hands, our own clothes and shoes, etc, but keeping all of this organized and accessible – it’s just really difficult and frustrating – we’ve tried reorganizing a number of times but with limited success – so the Easy Closet system would be a huge benefit for us and help to keep the family on track. Thanks!! I love the clean look….I would redo my closet. I love how easily you can change the design to accommodate different tastes and spaces. I would use it in my sons room. Love the simplicity of creating your own customized design! I would update my closet–it desperately needs some organization! Thanks for the giveaway! So I took your challenge and got on their website to play with the design feature. I love how easy it is to use and that it looks just like the finish pictures. So there are no unhappy surprises when your product arrives. It is a toss up which closet I would redo. My boys share a reach in that could be more user friendly but our master walk in is a bunch of wasted space that could use a redo. Love how adaptable they are according your needs, and changeable when those needs change. My master bedroom closet is way too small and needs some type of arrangement that will work in the small space, so it is the one I choose. What wonderful ideas! We have just downsized and our shared master closet is teeny. I’d love to see the ideas for maximizing this space! I would like to redo my master closet. It is so poorly organized that so much space is wasted. I love the online design tool!! I love how you can see everything. Looks so neat! Thank you for the chance to win. I’m a mess when it comes to organizing but I’m learning that’s mostly because my things don’t have a home in my closet. With easy closets I can customize my space to fit my stuff instead of trying to do the opposite. I would do one of my boy’s closets. I would love to do all if the bedroom closets. I am so excited about this giveaway. We are moving into a new house and I love how organized and sleek all the examples look. I would definitely want to makeover the master bedroom closet since my husband and I will be sharing a closet for the very first time (we always used separate closets before). This would be a great solution for my sons closet when we move his bedroom from one room to another. I think the online tool is handy and I like all of the options. We would choose to do the closet my youngest girls share. Thanks for sharing this! I would love to organize my own closet! It really needs it! Thanks for reviewing Easy Closets! Great closet system! I like the 2nd combination with drawers, shelves, and shoe racks along with hanging space. I love their online design tool. They have sooo many options to help create the perfect closet. And I need all the help I can get! I would love to do this to my daughters closet. She has the smallest room in the house and we need some food organization to fit all her stuff! Love the drawers!! I love how customizable it is! That it’s not one size fits all application. Out laundry area could really benefit from a redo!! I love all the drawer space in the closet I saw! I would redo my daughters closet similarly! I would love to do this for my daughter! She is transitioning from a little girl closet to a teen. The customizable aspect would be perfect for her! I love the drawers! I’d makeover my girls’ new closet. My daughter’s closet is in need of organization so that she can keep her clothes off the floor and put away. This seems like a great system that is easy to design and install! We bought an old house and they didn’t have very big closet back then, so I m using a small room for my closet, would love to have one of your organizers in it. I love that their website let’s you see design ideas! Very cool site. We are moving to a house and will finally have closets! I’d love this for my first closet! I love the look of the closet systems, I would do my laundry room. We recently downsized our home and I now share the master bedroom closet with my husband; I used to have my own closet. It would be wonderful to have this shared closet organized! I am in the process of making over my little girl’s room & this is just what I need. The ability to get the hanging things on her level. What Iove most is the ability to change the closet as her needs will change! I love that this system can change as my needs change. I’ve never had a closet system! The hanging rods that come with the closet are always what I’ve used, and I’ve added small storage units that never work! My college age daughter moved home to save money and shares a closet with her sister! It’s a mess! I would redo their closet so their space was more livable!! I love that it’s customizable and that there are many options for drawers and shelves! The idea of drawers in a closet seems awesome! This would be much needed in our master bedroom closet as one of the hanger shelves in the current closet has fallen and we need a new solution that’s durable to fix it since the one we had clearly couldn’t hold our clothes! It would be a hard decision because all of our closets are in desperate need of a makeover!! I think I would try to do mine and my husbands closet first! The online design tool looks awesome. Need to do my master closet. The EasyClosets website is so easy to use. They offer closet ideas in case you don’t know where to start. I’m expecting and I need to get a better closet system for the bedroom the baby is going to share rooms with. EasyClosets is going to be the place to go to for help. Would LOVE to get my walk in closet organized!! Thanks for sharing your closet and this give a way. I am an organizer at heart, not profession. I would love to fulfill a recurring dream of organizing our spare room closet to make it a combined craft room/office. Your girls’ closet is the boss!!! This would go in my boys’ room. A shared closet is a disaster right now. I like the different options if hanging area, shelves, and drawers. Smaller spaces (a drawer, a shelf) is easier for them to manage vs. one big closet space. I love that it’s versatile, so it can change as my kids grow. It’s also a beautiful addition to a room! What I Ike is about easy closets is the online design tool. I also love all the product options! I would make over my sons closet to utilize the space better. I love the clean look of the closet system. I would do the master bedroom closet. We have a full house and we have to share the closet with our 8 year son and a 1 year. Our closet is getting swallowed up by clothes and needs to get organized. I love that you can do it yourself. I am doing a total make over in my girl’s (4 & 5) bedroom need something that can grow with them. As they get bigger so do their clothes which obviously means space is getting harder to best utilize. HELP ! I will definitely be checking out the online tool! My hubby and my closet needs some major help. My kids closets could use a makeover too. Thank you for this opportunity! How handy that you can design it online! I love that I can mess around with the different design options! I love how it quickly organizes a closet and you can see everything in its place. I will do the guest room closet or as we call it the junk room closet. I love the way Easy Closets makes a closet organized. I live in an older home with minimal closets so using this space efficiently is a premium. If I win, it will be either my closet or my son’s closet (which still needs to be built). I love the closets. I recently got on their website and started to play around. It is easy to use and so affordable. I am saving up for my dream closet! I love how easy closets is custom and they can do any design you want! I have had it on my list for years now to redo our master closet! This is great! One of the things I love about your new closet is all the drawers! Drawers make it easy to organize, but also hide thing away… So the closet looks nice and neat. If I win, I’d love to redo the closet in our master bedroom. The online design tool rocks! I would love to design my closets and see how much more space I would have. I’m going to say our closet for sure. I love this idea of utilizing all the space in there by customizing and being able to change the layout as you need/want to. I’m sure we could free up some other rooms’ closet space by doing this! I want to check of the website for sure! My husband and I purchased an older home, with an older home comes small closet space. We’ve decided to start working on expanding our family. It would be great to finall get our clothes out of the extra room, into our master suite and use it totally for a nursery. Easy closets’ system is something he and I could put together ourselves as a weekend project. I also love the clean look the closet system gives you. I definitely want to do a makeover on the master bedroom closet. I love the closet makeover. My son just moved back in our house with 3 children, I really need some organization for the girls bedroom. OMG! ! I love the new closet! I have several I would love to organize! Currently our teenage has the only organized closet with any decent space (because his whole room was recently renovated). I would LOVE help with organizing our daughter’s shared closet space or the two small his & hers closets in the master (approx. 4×6 each) Both spaces are cluttered & very disorganized! Thanks! I would love to get my husband’s closet in shape…that’s right, my husband’s! I love the idea of replacing space-hogging dressers with in-closet drawers. I love that the closet can grow & change along with needs of my young children. I would definitely use it to organize my daughter’s cluttered closet. I love how organized you can be with these closets…. I’d love to makeover MY closet! Great post! Nothing makes me happier than when we clean a room and it actually looks clean..lol! I love that you can mix and match to have a completely personalized system for any budget. I would absolutely love to use this in my girls closet. My 2 little ones share a room and closet space is at a premium. I currently have a dresser in the middle, baskets all over, and a hanging system. I feel like every time I put their clothes away, I end up reorganizing the whole thing because it is never working. Thanks for this opportunity. I like that you can plan out the EasyCloset and see it first. We’re just moved into a new house and have nothing, but a rod in each closet. I’d probably do the master or the playroom. Wow, I love the fact that you can change the design so easily as the kids grow. I have boy/girl twins that share a small closet so it’s a challenge to get all of their things organized! I LOVE this concept! I would love to organize the master bedroom closet. There is so much underutilized space just being wasted in there. I have priced these closets out before but just haven’t been able to bit the bullet. This $1K would help! I would not have thought designing a new closet would be so easy. I love the online design tool..now I can see what my closet would look like with various options. My master closet could be so much more useful with EasyClosets!! I can’t wait to play with designs online! Amazing! I would start with doing a closet for my craft room! I would love to play with a new design for our own closet! I’m certain we could utilize more space with the customization and free up some closet space in the spare bedroom that holds a lot more of our stuff! I would love a closet design. I am 67 and disabled so it’s difficult to even get things in and out for myself. You seemed to create more space! You were zctually able to put more things in because of their arrangement.. I love the online design tool. I would love to redesign my daughter’s bedroom closet. Love the online design tool. Would love to redesign my bedroom closet. The possibilities are endless!!!!! I love love love these products! If I were to win I would definitely redo my craft closet! I love the look of the Easy Closet! I would do my master bedroom since it needs reorganization badly. I love that you can design online. Would probably do my closet or one of the kids’. I love that the closet you design for a younger child can be easily upgraded as they grow! If I win, I’m 99% sure I’ll be redoing our Master Bedroom closet first! I love that easy closets can be changed to fit your immediate need. I would fix my daughter’s walk in closet so she could store her drawer items in the same general space as her hanging items. This would open up her bedroom so much and make it feel more comfortable. Thanks for sharing the pictures of your project, it looks wonderful! I love your designs. It looks so neat and organized! have been trying to redo my closet. Right now I only have one rod, that doesn’t help keep my clothes organized at all. I would love, love, love a closet system for my closet! My kids already have organized closets, but like usual the mom puts everybody else first. Being a single parent who works full time and goes to school part time I would love to have my stuff organized to make my life a little easier. I love how this would utilize the space in my 9 year old daughters closet…..there is so much wasted space. I love being organized and am having a fit with my 3 year old daughters room and closet where we are renting! We are building a house so this would be perfect to assemble in her new closet! I love the transformation in your daughters closet, everything has it’s own place which makes cleaning easier! I love that easy closets has many configurations, such as low hanging clothes bars. I plan to put the new closet in my 6-y/o boys room. He can get dressed himself, but it is hard for him to reach his shirts, therefore when he pulls a shirt down, he usually brakes hangers. He needs a closet system in his height to function optimally. I would love to win!!! My oldest daughter is in the tiniest room (seriously) and we are desperate to get her closet in order so that she can actually have room to play in her own room. I love how customizable the entire system is! I would re-do my own closet that I share with my husband. Love the idea of customizing a closet and getting numerous options. Would love to redo my childrens closet, shared by three boys. I love having the drawers in the closet. I have three closets to update but would start in the guest room as I have already taken out the old closet and painted the walls. It is ready and waiting! I love the idea that I can pick and choose what would work best for me. I would organize the playroom closet or my son’s bedroom closet. Both are equally ridiculous. I would organize our master bedroom closet. The prize would be a great start…I am sure it will take more than $1000… But what a great beginning! nice! I had a nice closet system in a former home, so helpful and it was lovely when I opened the closet door! In our current home, my preschool daughter’s closet needs some serious aid….sadly, it’s low on the remodel list. I live in an older home with her and his smaller closets. I think this might be the solution that we have been looking for. Stylish, easy and affordable! I love the idea of the drawers in the closet. It would give more space in the room if you didn’t need a dresser. I would do all my kids closets. Then mine if I could. My closet system recently fell off the wall. My clothes are everywhere! I love that I can put in my dimensions and design what I need. I cannot wait to try it out! I love the idea of being able to get rid of the dresser in my daughters small bedroom and opening up floor space. I love the sleek look of this. Oh I could so use this in my daughters’ walk in. It is hard to organize w/ a 12 &5 year old sharing it. I love the functionality and hearing how great the quality of the product is. I would really like to redo our master bedroom closet. I love the fact that the space will grow with you. I would make over my master closet. My husband has completely taken over the closet, and oh boy does it need some organization! I love how simple these closets are to design! And I know I’d get my money’s worth because they review the designs before purchase. I would probably organize my kid’s costcloset – we have 3 toddlers (2 boys, 1 girl) in one room sharing one tiny reach-in. 🙂 this would be wonderful! I like the versatility in designs and would redo our front walk in closet!! I really love to organize and I love the online design tools that easy closets website offers, how helpful. I would love to organize all of our closets with this system however I would pick the master closet first. Our family of four lives in a very small space(600 Sq Ft) and organizing is a must. Using the easy closet solutions would help us tremendously.. I LOVE the drawers!!! My boys that share a room NEED THIS!!! I would do our master bedroom closet. Our closet is narrow and in need of organization desperately. It would make our lives so much easier since we are very busy always helping others, which we love doing. I love all the ways you can customize and get the exact closet that fits yor needs. All my daughter has is 1 bar so I would redo her closet to make it Bette and give her more room since she has a small bedroom. The best thing—that I would finally be organized. My craft closet is in need of a makeover! Crossing my fingers! I would love to add some serious function to our closet. It’s so hard to figure out how to organize the 1950’s basic style closets. The Easy Closet systems look like they would help me a lot! Thanks! We’re moving to our new house in 2 weeks! My 3 boys will share a room and will need storage solutions bought/installed. I love that this solution can be designed to fit needs and that we could possibly go without buying a huge dresser! We also will have a large master closet with a lot of wasted space. This solution would be great for “floor to ceiling” usage. If I won, I’d do a jig! I love how much storage space you get! I would definitely be wanting my master bedroom done, my husband and I have been trying to get more organized and this would make a huge solution. This is something I have been dreaming about doing for our closets, and the cheaper solutions I have come up with to make do isn’t working. Would so love to have an organized closet! We live in a very small 1940’s home. Closet #1 is about 4×4 & other is a little V shaped thing. Would love to see what easy closets could do with the 4×4. I would love to do my closet, but I would probably end up making a craft closet. I think that would serve my family the most. I love how simple you showed it to be and the fantastic finished results! Oh my gosh! I love that this looks like a project I could handle by myself. I would definitely start with my master closet (which is tiny!!) and then do my daughters closet too!!! I love how easy it will be to find what you need and I would makeover my dsughters’s closet!! I love that there are so many options offered for different organizational needs! Beautiful! We have a VERY small master bedroom closet, and I’ve reorganized it probably 8 different types ways since we moved in the house 3 years ago. We plan to be in this house for at least 10 more years, so a solution to the cramped closet would save me many years of frustration! I like that the closets are completely customizable to the different needs of the customer. I would love to revamp the closet in our room, as we have done the kids’ closets already. It would be fabulous to be able to redo my and my husbands closet. It is very small and sharing it with so little space and organization is a nightmare. I love how the organization with the EasyClosets can make a small space hold so much stuff. I would love to do the closets in our bedroom…so much wasted space. I could combine all of our clothes into one and use the other for my fabric/quilting stash and supplies….LOVE it! I love the way you can customize for an organized closet space! I love the closet organizer and would love my master bedroom closet organized. I love it! We really need to do a closet for our 7 year old. She needs to be able to better reach her items, and to be able to store more in the closet so she can have a smaller dresser. This would be perfect and get her started in the right direction! I love this concept. Someday I would like to do all of my closets, but the one that needs it the most is the office I share with my husband. I am an online middle school teacher and he is a IT guy. We need an organized space that would allow for my books, binders, and field trip supplies. Plus, space for his computer parts, DVD’s, wires, and everything else he has on top of his desk. Our office is only 10×10 room with a closet. Organizing our office closet would help us both so much. I love the fact that Easy Closets is attractive as well as functional. They use even small spaces smart. I need help in my organization too. Your daughters closet looks great! I love that they provide organization and customize especially because we live in an older cottage home which means the closets are very small. I would redo my entire closet. I love that you have the ability to customize to your own personal needs!! I need EasyClosets for my bedroom closet, it’s aweful right now. I love the online design tool and how easy it looks to install!! I would love to redo both my boys’ closets is way! This is fantastic! I would do my girls’ closet as well, to make one dresser obsolete and give them more floor space in their room. I love the look of these closets. Right now, I have 3 girls sharing a room and I have their dresser in the closet so there is enough room. The online design tool is fantastic! I would redo my own closet. I would love to be able to do my son’s closet that right now has clothes and toys stored in it. I love the easy closets website!!! It is simply amazing! If I win I will make over my master bedroom closet. The closet unit that was in there recently fell from the wall……..my closet is now a mess with no hanging space or drawer space where the closet organizer was at one time! We need to redo 2 closets one in my spare bedroom that I want to make into a craft closet & one in my laundry room that is used as a coat closet but also holds mops, broom, vacuum etc, both closets are always a mess. Help I need to get organized!!! This looks like it would be the perfect solution to my daughters room! Trying to accomadate an 8yr old and a returning college student has me trying to figure out how to make storage work for them both for 4 months out of the year! I soooooo need this! You have no idea. I am a travel nurse and when I’m not on a travel assignment I am with my mom at her house and my room is super small and I have too many clothes and things in general. I’m currently paying for a storage space and the price just went up and I really want to get my things out of storage, out of her garage, her car and her living room. Lol. My things are everywhere and I’ve tried to organize but was just thinking I needed a way more effective way to use the space in my not big enough at all closet in my room. I would LOVE to have this makeover!!! You have no idea how much it would help!! Fingers crossed!! I love the way your daughters closet turned out. I also love the fact that by having such a beautiful and organized closet you don’t need all the extra furniture in the bedroom. I would redo my sons and daughters closet. I like the concept of being able to explore your design options to help maximise your space I would have to choose my closet cause as most mum’s out there you never do anything for yourself, maybe I could include private coffee/tea space in there . My two girls share a room and could definitely use an update to their closet to maximize space. It looks very easy to install from the pictures posted and the design options appear to be many. I love how many different ways you can use these to get organized. I would use it in my scrapbook room. I love how easy your daughters’ new closet makes it for your girls to keep themselves organized! I would LOVE to do all my closets………..that would be a dream. I have no shelving in any of my closets in the whole house. It is so frustrating. Every closet has two hanging bars and they are to the ceiling so they are of no use, because no one can reach them…..The closet I would do if I won would of course be my daughters………don’t the kids always get everything? It’s beautiful! And functional! I would probably makeover my closet. I like that there are so many choices and options for closets! I would put a closet in our kid’s room. I would love to see my son’s closet organized like this.. drawers to put things in..a place to hang clothes..without so much wasted space. A trailer house starts off with no storage space and then add a kid with too many toys lol its a mess daily. I love what you did to your closets! I would like to be able to get my small, square bedroom closet organized. I have wire shelving but the square size is hard to work with. Honestly I love it all, I love all the organization. We just purchased our home so there are so many things I want to do. My closet totally needs organized… I just have bags of shoes on the floor. My oldest daughter is in a bedroom that does not even have a closet so we purchased a cheap stand alone one from walmart. I have a hall closet that I think is the top priority though, I want it to be mudroom style because I have shoes just laying in my entry way and coats never seem to make it on a hanger. I have tons and tons of plan for this place. I would love this for my three boys that share a room. It would make finding things a lot easier. Love the clean lines and versatility. Would redo my bedroom closet first. My closet is in desperate need of a makeover. I need some shelves and in general just a system that will work. I LOVE this. If I were to win, I’d probably make over my youngest son’s closet. We are about to have another baby and the baby’s room does not have a closet so my youngest will be sharing his. Some organization to it would be nice. I love the clean look of the EasyClosets designs. We are moving in June and my daughter will be downsizing closets. This would look beautiful in her new room! I love the online design tool. I really allows you to play with different options and “see” what will be best for your space. I plan on redoing my girls closet. As they are getting older and have different needs now. I need to adjust the space for them. I also plan on tackling my husbands closet. His closet is good sized, but he is not using the space to its potential. It’s great to see that there is a high quality, fairly priced company out there. Thank you for such a detailed review! AWESOME! ORGANIZED! My husband and I share a closet with twin girls, because we only have two bedrooms. My son has one of the bedrooms and the girls and us share the other one. We REALLY need some organization in our closet. I have GOT to clean out our closet and REORGANIZE it so that it works for everyone. I have been doing a lot of thinking…I want to add more storage space in our closet. There is a LOT of wasted space. I love all the customizable options! Especially the shelves and drawer options. I would redo my son’s closet. He desperately needs an organized closet! I love how neat and organized the Easy Closet makes the space. We are currently in the process of adopting two children. The closets in our new home are atrocious and need to be updated. I would be redoing their closet to make things more kid friendly, and easier to access. It appears to be a very flexable system. Would love to do this in my Master Closet. I would LOVE LOVE LOVE to have our master bedroom closet renovated. The people who built our house didn’t effectively setup our closet so it’s practically useless. Oh my! I love your transformation; I would love a system for my little girl. She has stuff everywhere and nothing is organized. I would love to be able to go to her closet and find everything and not have to go all over her room. I love how you can customize the system yourself. Her room is so small we are in desperate need of easy closets!!!! Fast, easy and affordable. What’s not to love? Bedroom closer makeover time. I love how you can design it yourself online using the dimensions of the space you have to work with! If I won, I would redo the close in my kids’ shared room. Right now it’s just a regular closet with one rod and piles of folded clothes underneath the hanging clothes. Love, love, love the new closet! EasyClosets definitely gives you the opportunity to customize your closet to it’s fullest potential. I am in desperate need of organization in my master closet – it’s one big rectangle that could be amazing with a little help! I love how easy they seem to build. If I won, I would put this system in my craft room/spare bedroom closet. After reading your blog on this, I can see that organizing this way is a lot more affordable than I had previously believed! What a wonderful way to keep things best and tidy. I love how organized your daughters’ closet looks and how easy it will be for them to find their things. I am hoping to redo my closet to better utilize what space I have. I like the ease and understanding of the systems and also the ability to customize. With a system like this I many be able to store both my clothes and my husbands. He will be thrilled! I love the valet hooks. What a great way to plan you clothes for the next day. I would do my oldest daughters closet. It is tiny and she likes everything…so she runs out of room. I love that it can be redesigned later if your needs change. I would do the master bedroom closet. I love that it is so customizable and that it will grow with the kids. My girls share a room and have a very small closet. I would makeover their closet if I won! Yours is beautiful by the way!! I love the design tool and I would makeover my boys’ shared closet. It’s a chaotic mess. The best thing was how organized everything was as you were putting things together, so you didn’t open unnecessary boxes before you needed the supplies inside. My closet at home, which I share with my sister (both in our 20’s) desperately needs a makeover. We have stuff hanging and some thigs on shelves, but there just isn’t enough room and I can never get to “my side” of the closet to see what is hanging up. Both my sister and I complain there isn’t enough storage for either of us. We could really use the help! What an AMAZING space! Who doesn’t love to be organized? About 10 years ago when we remodeled our bedroom my husband incorporated an organizer that I designed & he built, but over the years, it definitely has not grown with us. I would love a chance to make the space more functional! It is a huge space so I’m sure there are some awesome options that would make it much more functional & $1000 would get me a great start! I love the different styles and configurations you can choose from. I have 2 boys that share a closer and it’s a disaster. If I won, their closet would be made over. I have to share a closet with my husband and it would be so much easier with an Easy closet organizer! I have actually looked at Easy closets before and fell in love with them. I have just never been able to spend the money to get one. Our home is very small and houses 2 Adults, 1 teenager and 2 preschoolers and we have NO storage. I would love to put this system in our master closet as it currently has the most wasted space that could be used for extra storage space. The online tool is great. I have a hard time deciding which closet as all of ours would benefit greatly but probably the master bedroom or my boys room! I love the “start your design now” tool on this site. It’s hard to know exactly how to plan such a project, but this makes it easy to visualize. I would LOVE to win a closet makeover because our master closet is so tiny, we need all the help we can get. I would love this for my daughter’s room! We have another girl due on 7/14/14 and this would be an answered prayer to our lack of closet space. 🙂 I love how seamless EasyClosets makes the organizing look! I love the looks of this system. I would makeover our bedroom closet. It’s very small and a lot of wasted space. I’m always putting my children first so it would be nice to do something for ourselves!! Love how you can customize. Hopefully easy enough even for me to install. I have a good sixe master bedroom closet but it’s not very efficient. I could use Easy Closets to make it a lot more functional! I like how you can customize them. I would do the closets in the master bedroom! I love how organized it turned out! I just can’t seem to do it myself! I love have things organized. When a closet is organized, it spills out into the rest of the living space, be it family rooms, bedrooms, kitchens, everywhere. I would love of my son to have one of these closet spaces. The drawers would be amazing. Thanks for holding this giveaway. I love the versatility of the units and the ability to finally make my closets work for me instead of me working on them 3 to 4 times a year ( I can never seem to get them properly organized). As for what closet I would re do…. that is a tough one. I have been blessed with plenty of closet space.. just not the common sense to figure out how to use the space efficiently. But out of all the closets I would have to say my daughter’s is the worst. I would start there… but soon after be purchasing units for all my closets. I LOVE that everything would have a place and there would be less need for furniture in my son’s already tiny room! I love the layout and organization of these systems. I would love to redo my personal closet. Would LOVE to make over my closet! Everything is crammed in there! It would be nice to be able to see what I have. 🙂 Looks like the easy closet system is a great way to go! I would love to be able to customize my closet. Great organizational ideas. Your new closet is beautiful! I would do the closet in our master bedroom. it really needs help! I love that Easy Closet is customizable and can be rearranged when our needs change. I have 2 boys ages 6 and 11 sharing a room. Their closet is atrocious and something like this would make organizing their room so much easier! What a huge relief this could be for them! I would love to fix my daughter’s closet up like this ! It would be great to have her closet so neat! I would love to use this awesome resource to organize my daughters closets. They share a room and the closet needs some organization for sure! I just love the organization and those drawers! I would do my daughter’s closet. I think by doing her closet I could get rid of her huge dresser that takes up so much room. I would LOVE to win this for my closet. I live in a small condo apartment and no matter how much I try to pare down my clothing, my closet always seems to be overflowing and messy! I love the on line tools that allow you to design your space. If I won, i would love to re do my youngest daughters make shift closet. she has no real closet but a great space to create one. What I loved the most about EasyClosets was how much functional room with versatility they are able to create, even with limited space. I would definitely customize our Master Bedroom closet. I would love to update all my closets!! But if I had to choose just one, I think I would do my sons closet..I have a 17 yr old and a 12 yr old sharing one room with one closet! I love the idea of drawers and a place to hang clothes!! I love the design tool – it does what my brain just doesnt seem to do well! I would start with my boys bedroom – my two youngest share a room and closet and it is a constant battle to keep it organized. Thanks for this contest! I love that this is so neat and compact I have a small closet in my room that has bifolding doors and it is really hard to make it work in this closet. I would love to redo the master closet. I’ve had shelves collapse (cheap wire, not installed correctly) and I just shut the door so I don’t have to look at it. This would make my life so much easier and organized. I’m commenting on the Easy Closet Giveaway… Your post couldn’t have come in a better time, we are moving into our new house and the closests look so basic. Then I saw your post and I loved the designs!!! I can’t wait to get settled and start designing our dream closet. Thank you again for your post, it looks amazing. I love how they have so many diffent ways to organize items. And can be changed. I would makeover my children’s closet because they share a room and the closet and one of these would be the perfect solution to the un-organized chaos we have right now. That closet is beautiful. I need a system like this for the closet I share with my husband. I love how customizable this is. I would makeover my daughter’s closet. She needs organization and a place for all her clothes and shoes! I love the designing aspect they give you online! Will definately use! I love to be organized, every thing with a place and everything in its place! My son needs to learn this a bit and a made-over closet would be very helpful. I love the design capabilities EasyClosets has to offer. With the versatile features, my family and I would enjoy the organized space of the master bedroom closet. Here is where I not only keep my clothes and my husband’s clothes; but also, my photo albums, family games and much, much more. EasyClosets would make a great addition to our house with its quality and functionality. Honestly, there isn’t much not to love when it comes to EasyClosets. Thanks for the opportunity. I love your makeover! I would pick my master closet to redo because its just shameful to look at now! I have 4 children, two of which are now grown. For 22 years my hubby and I have worked on the kids’ rooms to make them comfy and (semi 🙂 ) organized. Meanwhile, our closet has been a total catch-all for everything from mending to keepsakes to outerwear. I would love nothing more than to organize our closet to have our clothes and shoes at our fingertips and utilize this to help make our room the haven it should be! Love the on-line design tool and am in desperate need to do my daughters closet. These closets look spectacular! We are moving into a new home and I will be looking into this for the master closet and my daughter’s room! My master closet was intended to get built-ins. I have been waiting 8 years. There are piles of clothes everywhere and these systems look like a perfect way to get an organized and attractive closet! I love the design tool at Easy Closets. I want to make over my bedroom closet. Thanks for sharing your ideas and for the giveaways! So many closets so little time. I think I would start with my girls. Although the boys could use it a lot. Have 4 scouts in the house I need to organize uniforms, church clothes and other things. Of course there is also the pantry. love to redo my little girls closet. looks awesome! What an amazing giveaway!!! Your closet looks awesome!! I love EasyClosets website and the fact that I can virtually design it and will know what it will look like! I would LOVE to organize my daughters’ closet! They are 9 and 7 and it is a mess!! Thank You for this great opportunity!! I have started Homeschooling my kids and we have lots of fun things to do and learn about. So I would definetly have to re do my homeschooling closet!!!!! I like best that it looks so neat and professional. Its amazing!!! We live in a teensy house with two girls in one bedroom. The idea of customizable closets that will grow with our kids – that would be an awesome thing! I love that when you look at the big picture of furniture cost, etc the closet system is quite affordable and saves so much space. I love the ease of designing a closet with Easy Closet. I’d use it to do my son’s closet. Right now it has a mix of my clothes and shoes. I’d love to come up with a design to store many of the kids’ puzzles, toys plus clothes. I love your posts and blogs. Thank you for all the great ideas. bedroom would diffuse several arguments in our household. I would love to win this contest for her & my own peace of mind! I like best is there are no cardboard boxes stacked up, full of clothes that can’t fit in closet. I recently moved to a new house and yet my closet is full of boxes of clothes that will not fit. Same issue I had in old house. Its been 5 years since I have seen most of my wardrobe. I love that there is space for so much and yet you can find and see the whole wardrobe. Whoohoo! It is possible. I love that Easy Closets is completely customizable! I would probably redo my daughter’s bedroom closet if I won; I can’t seem to keep it under control…lol. Would be the BEST Father’s Day present ever for my husband! I love how the closet system will make my life easier, and help my two young boys access their things so much easier! I LOVE your closet makeover!! We are in the process of building a new home and if I were to win this closet makeover, it would be my master bedroom closet that gets the fix!!! Thanks for sharing! Love they are customizable. Love the online tool let’s you see and measure before you buy! I love that this system is totally customizable and can be installed by me. I would love to make over my husband’s closet and he is always last in line for any improvements at home. He dresses up everyday for work and needs an easy to use and keep us system. This looks like an amazing system. Organizing your closet can make you feel so much better and Leeds to organization in other areas of your life and house!! I love the versatility of the closet designs. It would be awesome to use on my craft room closet! I love how they are custom & look so clean & organized. We are doing a master bedroom & bathroom addition in our home, so I would use Easy Closets in my new 7×12 walk in closet. Love the organization, the on-line design feature, and the fact that it’s “Easy”!! This would make a great closet in my sewing studio to store finished quilts, store fabric, store quilts in progress, notions, etc.!!! I like the closet system because there are many options/configurations available. I would make over my daughter’s bedroom closet because her closet is the most disorganized one in the house. I love the online design tool, and how you can decide how much to spend as you go! Love it!!! It is amazing that Easy Closets makes their design so user-friendly, enabling customers to visualize what the finished product will look like! I would love for my master closet to be organized and clutter-free. Right now we have tiny shelves on the floor for shoe storage and the only shelving on the wall is too high for either of us to utilize. I have been looking for a system like this that would let me piece it all together for a finished look that uses all available space! I love all of the options for a custom closet and the price is GREAT! I need an EasyCloset makeover for my 8 year old granddaughter’s bedroom closet! (she lives with me part of the time) There’s an old dresser in the closet, taking up too much space, but there is no room for it in the room. She needs more shelf and hanging space. I would be thrilled to win!! Just to be able to get stuff off the floor and into its own “home” would be peace on earth. All the cubbies and drawers would be fab! I would makeover my sons closet. We have to use part of it for storage and it could be so much better. I love the fact that it can grow with him and it could move with us whenever we move. I really like that the drawers are part of the whole concept and how streamlined everything is! So excited to do this for all of our closets! I would love to reorganize my childrens therapy closet there is so much going on that it tends to get all jumbled up and messy fairly quickly being a single mom to two boys with various disabilities makes time and resources hard to obtain would love to win this would help my family out greatly. I love the drawers in your closet. I would love to remake my entry way closet. We have 6 people in our family trying to put shoes, boots, backpacks, coats, keys, etc. into this closet because I don’t have a mud room. It’s a disaster! I’ve tried various ways to reorganize it and nothing seems very efficient. It is also across from my living room so I would like something that looks astetically pleasing if the doors are opened. My favorite thing about these is that you can SEE everything! I’m very visual and in my current closet, I just can’t see most of my stuff. This would be awesome! I’d totally make over our master bedroom (shared) closet! This is exactly what I need! We just bought a new house and my walk-in closet is in desperate need of help- the makeshift 2×4 contraption that holds the hanging clothes just isn’t cutting it! I love the organization that this closet systems gives to a closet. drawers in the closet would be a great addition. I live in a 100 year old house, so pick a closet….any closet. These closets look Amazing and I think I would start with my daughter’s and then do one closet at a time til they all look like these!! Would redo my bedroom closet for sure. I love that it can be made to work for small reach-in closets, the only kind I have in my older home! I love the price tag! I’m a loyal Elfa (Container Store) user, but this price looks very competitive and the selection seems to be bigger!! I would make over the closet in my daughter’s room! I would love to redo my craft closet. I have tried over and over again to organize it but this system would do wonders!!! Thank you for this opportunity!!! I like that you can customize your closet design with EasyClosets and the extreme packaging care they take in delivery. I would love to redo my master closet. It is a black hole in there! I love what you’ve done! I have a closet obsession and created an entire pinterest board dedicated to neat, organized closets. I’d love to update my master closet, especially since our master is too small for dressers! I adore everything about these. I think my favorite part is that I don’t see even one tiny little segment of wire rack shelving! Hi! I love the look of your girls’ closet! If I won the contest, I would re-do (or simply START!) our “master bedroom” closet. It’s not much of a closet, it’s an odd shape, and a total, utter disaster right now. It’s been making me crazy how disorganized it is but getting the supplies to get it in order costs money we don’t have! Fingers crossed my name comes up on the random drawing! I love that the current space we consider a closet now would be so much more functional. My goal this summer is to make all spaces in our home simpler and more functional so everything we have has its own home, making it that much easier to keep things neat and tidy! I love that I can plan it out and see what it would look like. Great to be able to show hubby. We both have to see a visual. We know what we would like to have but have no real imagination to come up with it ourselves. Lol. We need to redo our master bedroom closet or the hubby will have to rehome his clothes somewhere else in the house. Lol. I love how organized everything is! I would love to make over my closet because it’s a catch all for everyone in my house, the vacuum, batteries, extra sheets and pillows for everyone ect.. We are foster parents with 7 children in our home so space is very valuable here! I would love to redo my walk in closet. I love the fact that it is so easy that you can do it yourself. The price is unbelievable. If I had the opportunity I would design a closet in a room that doesn’t actually have a closet. It is actually a tiny room off of my master bedroom. It was a nursery when the children were younger but it is so tiny that it really isn’t usful now. I could put a closet down one wall and a make up vanity and a full length mirror on the opposite wall and since there is a full size window in the room it would have the natural light. The online component looks very cool. My husband and I have struggled to keep our master bedroom closet organized. That would be my cost of a remodel if given the opportunity! I love the clean, finished look! I like the available options as well! I love the packaging for such custom built pieces that’s awesome. I also love how it’s customizable to each closet. I’d use it got my girls shared closet. I love your new closet! It looks so organized and beautiful! I have 3 girls who share a room and they would benefit from this closet organizer greatly! I love the complete customization options & the fact that it looks so great & everything will have a place! We have one large walk-in closet upstairs(well, it’s not THAT big lol), but it’s a mess & not functional..so that would be the one I would makeover if I was blessed to win! I love that it is.customizable to your particular needs. I can’t decide which closet I would redo. I could do my craft closet, or the master closet, or one of my kids closets. The possibilities are endless! That closet looks amazing!! So I clean out my master room closet about three times a year in hopes that the rod doesn’t break. At some point I will have to stop using the bottom rod since it has started pulling away from the wall. At this point I can’t afford to redo my master bedroom closet… Buy it’s on my wish list. I love that these closets are so versatile! I would redo the small walk-in closet that my husband and I share! He is in Law Enforcement and his dress uniforms and casual uniforms are such different lengths and all of his boots and hats for work all need such different spaces that we just don’t have in our current closet. The key is organization! I would love to have an organized master bedroom closet! I like that they are customizable, and I would do our master closet! I love the flexibility of the closets. I would probably start with on of the kids closets but then get hooked and want to do all of them! What I like best is that it has drawer capabilities. The closet I’m choosing to redo is the closet in my art studio. Having the ability to have drawers instead of just shelves would be great. The side areas are proving hard to use w/ just shelves so I would love to stick drawers in there. I love the design tool! It can be so challenging to maximize use of space, I love how easy this system really is! I would use it for my Entry way! Love!! Makes an outdated ‘holding place’ for clothing and accessories look like a million bucks!!! Its BEAUTIFUL!!! Organized life = Happy Wife!! I love the customization. We’re moving into a new house and could totally use this to upgrade our existing closet. I would arrange my spare room closet so that I had a space to store all my scrapbook supplies so there was easy access and I could see what I had more easily than the way things are stacked right now. I love the design tool! We recently remodeled our master bathroom, which we have to walk through to get the closet. The master closet is a hot mess and needs to be updated to match the bathroom. It’s a walk-in closet with a ton of space, but the way it’s currently arranged, along with all the junk that is just thrown in there, it feels like there’s no room! I love the fact that you can design it to your exact needs and that there is someone available to help you think it through. I would use it on my bedroom closet. Such a great solution. I love the flexibility of the options to choose from. I would do my closet – I need all the help and space I can get! My girls also share a room and their walls and closet look identical to your before picture. The closet organizer would transform mornings getting ready at our house from chaos to peaceful. I love everything about EasyClosets, especially that you can visually see what your closet will look like before you start assembly. The directions look so organized, love it! EasyClosets will go in my bedroom then I would install in the bathroom linen closet. LOVE IT!! I would definitely make over our bedroom closet. My husband has a lot of dress shirts and pants, but having a bar at only one height leaves a lot of wasted space. This looks like a great solution at a reasonable price. I love how it just helps you stay organized, love option B this would be great in our home since our home doesn’t have closets and we are planing to put some in, this would be a great help! The EasyCloset system is so versatile and looks great when it’s installed. I’d love to re-do our master closet which is a large reach-in similar to your girls. I’ve had a design drawn up for a while, just haven’t taken the leap to buy and install a new system. I would love to update my master bedroom and redoing the closet would be a great first step. What an amazing idea. We have a walkin closet, very large, but the way it was designed, it does not use all of our space to its fullest potential. Would love to redesign it to use all of the space better. I definitely like the diversity of easycloset and would LOVE to redo my front (foyer) closet!! Great closet makeover! I’d love to get a launch pad/ landing zone closet set up, to hopefully get out of the house easier with my 2yo twins! I would love to win this closet organizing system for my daughter. My 14 yr old has had a very rough year on all fronts and I would love to find a way to make pieces of her world easier for her. Easyclosets would be a great start in creating a comfortable, manageable, secure place in her bedroom. Thank you! I love the online design option! We have 4 kids and a lot of clutter, toys and clothes! I would love to win so I could get everything organized!!! I love that their product gives the look and functionality of custom closets, but without the ridiculous price tag. I’d do our new master closet if I won. I love everything about EasyClosets. I would redo my oldest daughter’s closet. I like the flexibility that this system offers. The closet in my bedroom is a MESS and a weird configuration. I would love to redo it so it is more usable for my husband and me. I love the online tool. You can explore different designs before making final layout. I would redesign my bedroom closet. I would love to win this for my daughter’s bedroom. She just turned 10 and is starting to need more closet space. The older they grow the bigger their clothes and shoe collections become. I love being able to design it on their website and see what it looks like before making a decision. I would makeover my master closet which is small but needs more storage options. I LOVE the Easy Closets Online Tool! Men enjoy “building” a new car on car websites…finally something fun for us women! I enjoyed trying different configurations to fit a budget. I would totally redo our master bedroom closet which is a rather small walk in. Not only would having the Easy Closet system in there be awesome…it would give me motivation to purge(and donate) all those old clothes we do not use. With their reasonable prices and a generous $1,000, I actually think I could reorganize 2 of our closets! Off the top of my head, I’d say our kitchen pantry and our downstairs family coat closet. If it absolutely must be only one and it must be a proper closet, then it would be my son’s bedroom closet. It is the smallest and has the poorest design. As his room is also the smallest bedroom, he’d would benefit from drawers in his closet to reduce the need for such a large chest of drawers on his bedroom. This would be such a blessing no matter which closet we chose to redo. I really like how they have every possible option available to suit your very specific needs and at a reasonable cost. I would love to do the master bedroom closet. I like all the drawers available for the closet design. You can eliminate a dresser on the bedroom. I love the simplicity of creating your “own” space. My master closet needs serious work and winning your giveaway would be wonderful to create my own closet that I can feel good about when I walk in. Wow what a transformation love the drawers! Now your daughters will know where everything is. I have one closet that could use this organization . Clothes, softball clothes, soccer uniforms etcetera, it’s such a challenge to keep it organized. I would love to redo her closet! Love the versatility. My boys’ closet needs help! Love the versatility of the Easy Closets systems and the online tool. I’d love to redo my master bedroom closet! I like that you can design it first, would like redo my bedroom closet because the other system I bought doesn’t quit work. I think I would start with my closet because it’s a huge space and I know we are not getting the most use out of it. But I will look into this for all my kids rooms, too! I love that they take the work out of it and it’s easy to visualize the changes with the tool. I’ve gone into different stores looking at closet organizers and cannot figure out what exactly I want and what will fit best. What a great product! Love! I would definitely do my girls’ closet. I have 2 sharing. Three soon. I would love to redo our master closet and add drawers. I loved your redo! The versatility, for sure because Storage needs change with the seasons. Oh I am in serious need of a bedroom closet makeover! I love this system, so customizable and affordable! Love it! I might even do my laundry room! I would do my master bedroom closet. Seems like there is so much wasted space there. What I love most about EasyClosets is the functionality and the maximum use of the space available. I would love a closet make over in mine and my husband’s shared closet in our bedroom! Thank you for a chance to win! It looks neat, clean and organized the way I want my closet to look. Also a space saver. This would be ideal for the craft room closet. The more storage, the more creativity. What’s not to love about this system!! I would definitely use this in my daughters closet. No matter how hard I try to organize and keep some kind of order for her, it’s difficult with a small closet. This would be a huge addition to help us out! Thank you for this opportunity!! I have tried time and time again to organize my two daughter’s closets but can’ t come up with a good solution. Closet organizers like these would probably solve all the problems and my frustrations as well. The only thing is if I win one I would then have to order another one so neither girl would be upset. It would be very worth it though. I love the fact that you can create your own closet. My daughter has a room that has a closet that is really unusable and I love the idea if we could use the site to give us some ideas for the project. We have wanted to redo this closet for her for years and winning would be WONDERFUL. It would help us to afford a makeover for her closet that we have not been able to afford. I like that you can design a closet to fit your needs. I would make over the master bedroom closet, it definitely needs it! Thanks! I love that it has so many options and also it looks really pretty. I would love to win this – what an incredible closet system! Getting all of our clothes put away is one of my hugest challenges. Particularly in me and my husband’s bedroom. Our closet is shaped oddly (It’s deep, and it also has 3 stairs in it). This would be a Godsend. I love an organized closet, and I don’t have any! I was recently told by an organizer that I should consider doing something like this in my sons’ room. 2 boys, one small closet and a small bedroom = no place for anything without a huge piece of furniture! Hoping to win this closet organizing system! I love Easy Closets! I have been on their website and it really is easy to design! If I win, I would use it to organize my master closet! My dad has installed custom closet organization in all of our other closets, but ours still needs to be done! My design is already done, just need to funds to purchase! Winning would be a big help! I love how you can maximize use of space with easy closets. I would love to redo my master bedroom closet as it is a mess! Your redo is fabulous! I have multiple children sharing a room. I would chose to makeover my boys’ closet. I’d definitely use this system in our master closet. The closet doesn’t function well right now and I can see EasyClosets taking it to a new level. Would love to post before and after pics, too! We have a tiny efficiency-style condo with an awkwardly shaped closet. Having a more functional layout would make a huge difference in our lifestyle. I love that you can create a custom design for each closet…I think I would redo the closet in our boys’ bedroom…the two boys share a room and a closet and it could definitely use a makeover :). I love that you can create a custom design for each closet. It’s very helpful, especially when you have a small closet to work with. I love that I could customize my kids closets to their height and ability to put their own clothes away and get them out! I would love to make over my master bedroom closet. The ease of use with the online tool make this an achievable goal. I love that there are ao many options available. It’s super customizable…so that makes it very user-friendly. I would love to make over the closet in our master bedroom. It’s semi-disastrous at the moment. A solution like this, would make a world of difference. I would LOVE to reorganize my Master Bedroom closet!! I am an organizing junkie and the Easy Closet has all the capabilities of making my life easier and it looks so sturdy too! Oh, how I’d love to win this!! Thank you for the opportunity! By the way, your closet turned out amazing!! Love that online design tool – that I can configure different variations and compare costs! I would organize my kids closets! I would love this is the master bedroom closet! All we have presently are the two hanging rods. Definitely would be nice to replace all those plastic storage boxes that are piled on top of each other. I love that they are fantastic looking and look like they are made to last. I would be thrilled to makeover our master closet. I would redo the closet in the guest room. The room also serves as ” my office”. It lacks the organization I need. Thanks for this great opportunity! I love the quality of these closets! It is furniture quality and changeable at the same time. I would love to redo my two daughters closet. It is very similar to your before situation and I love the outcome. I have priced these at different places and EasyClosets are so much more affordable! I love the different variations. I would probably make mine and my husbands closet over. Definitely due for some organization!! I love that they are modular. That enables them to have a system for every closet no matter the size or shape. My husbands job requires him to wear a uniform everyday which means lots of accessories. Belts,patches,insignia, etc. I would love for all of it to be nearly stowed away. A customizable way to have a place for everything so that everything can be in its place! Definitely would do the master closet! To be able to find anything in my blackhole-with-doors? That would be amazing! I’ve wanted my closet organized for ages! I would love to win! We had custom closets in our townhouse that we sold. I miss the customization that they provide. I love Easy Closets online tools to help design exactly what you need. I would makeover the basement playroom walk in closet which is a big empty space that has lots of potential but is useless right now! My master bedroom closet! Most of it is stacked in the bedroom (for way too long) because I get overwhelmed trying to figure it out! Having the materials done for you and ready to go is so many less decisions! Great product, great ideas! I love the look and how easy it is to design a closet. The options are endless! My master bedroom closet desperately needs a makeover, I hope I win! I love the clean look and ease of design of EasyClosets. My master closet is the one that I would use this on. For the first time in many years my husband and I have to share a closet and it is just not set up well for us. I would use this in my girls room. It will help simplify my life and theirs. I love how accessible things look and It also looks easy to install. I would love something like this in their closet. I love that everything can have its own place, making it easy to stay organized. I would redo our master closet. I really like that you can design what really works for you. My master closet really needs the help and I think I need this for my daughter too. Thanks for the opportunity!! This product looks simple to install and well built. I would use it to reorganize my master bedroom. My master bedroom closet has been a challenge, most of it has been stacked in the bedroom (for way to long) because I get overwhelmed trying to figure it out. Having the materials prearranged would make section making so much easier! Great product, great ideas! I love the look of easy closets. I would love to do my closet. I love that they took care in the packaging so you would not need to return anything damaged by shipping – that shows a lot about the integrity of their company. I would redo our master closet because it is in very rough shape and needs a massive overhaul! This one is a no brainer for me. I would use it to do the closet in my daughters room. We got rid of a lot of furniture with this last move including both of my girls dressers and have plans to do this to both of their closets. Love how easy their online designer makes it to decide what exactly I want to do! Adaptability as children grow and needs change is a great feature. Interchangeability of parts is also an excellent factor. We will be gradually making over all the closets in our house, as finances allow, probably starting with the Master bedroom. I like easy closets because of their online site to help you create the perfect closet for your needs. I am a stay at home mommy and on one income, so any home improvements have been put on hold. I would love to redo our master bedroom closet and create the perfect closet to eliminate all the wasted space. Any of my closets could use this! But I think my master closet would benefit the most….I love the fact that you assemble yourself…that means it’s easy AND you can change it up if if put doesn’t work out as planned! What a fun giveaway ! I would love to make over our girls closet and our front entry closet. Our girls share a room as well and I would love to keep the floor space and utilize the closet more. The front entry is used for shoes, coats, vacuums, beach items and we’ll is a mess. We need a great system to organize it completely. It looks like it’s really easy to install and the product quality is very good. I would love to organize my oldest son’s bedroom. I love how much love you put into making this so special for your girls. you have taught them so many life lessons with this one task! If I win, I will do the same for both of my daughter’s rooms!! Thanks for sharing. Pam L.
This is just what I need to keep my 2 youngest sons, that share a room, organized. The constantly have clothes on the floor because they cant reach to hang them back up! I love the endless possibilities to make it work for any closet! I would redo my master bedroom. What I love best about EasyClosets is that it can replace the dresser in a bedroom freeing up space in small rooms. I also love the online visual of creating your closet and seeing it before you order. It really helps! 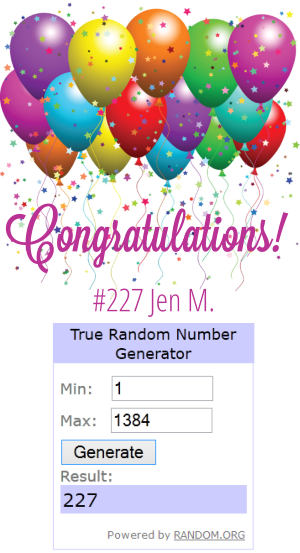 Thank you for the opportunity to win a new closet! I love all the options there are for your closets, from colors of the wood to the hardware to the many different designs! We recently moved in to a house with nothing in any of our closets so it’s hard to choose where I’d start but I’m thinking master bedroom as I’m tired of having no storage in my room, but I would definitely return to easy closets for the rest of my closets also when I can! I would do my middle daughter’s closet. She wants to get rid of her dresser and shelves as well as hanging space in her closet. She would love it if I won this contest! I love how easily it seemed to come together and how all the boxes were easily labeled. I would definitely re-do my master closet. I love that you can customize it to fit your needs. I would make over my daughter’s closet. I would love to win this to make over the master closet. We have a 2 bedroom house with very little storage space (2 closets). We try to store seasonal decor and blankets in our master closet and it’s so cramped that you have to walk in sideways! I desperately want this make over! I love the way it makes everything neat and tidy. My closet needs major overhaul since 2000. Would love to have this to make it better. I love that the things that need to be seen are seen and the things that need to be hidden are indeed, hidden! i love the built in drawer options! everything looks so organized and streamlined. I’d love to do my own closet but its just a 3 footer so there aren’t many options… i’d probably do one of my kids’ rooms since they each have to share! I love the look and style of the closets, it looks like furniture! As much as I would like to do my own closet, I would do my teenage daughters first. My condo has an oversized storage closet area that this system would be perfect for. It’s so hard to keep it organized and it just ends up being a dumping area. I love the incorporation of drawers in the closets. We, too, have resorted to putting dressers in closets over the years. If I won, we would do our master bedroom closet. My family is currently in the process of a move which will drastically downsize our space. We are going from a walk in closet to a sliding door closet. It would be awesome to have some help to maximize the space! This closet looks amazing! The EasyCloset concept is something even I could do…and I’m not a handy person! I would redo my master bedroom closet. It came pre-shelved when I moved in and I’ve never been able to make it work! I would love to have something that I had input on to fit my needs. I would make over my hubby’s closet and maybe the hall closet. I love the looks of the organized closet and that we can customize the items we want, I like the hanging space and the drawers. I love how it is so easy to customize a closet to suit my needs! I would make over our master closet. I need a place for shoes, purses, and winter things like scarves, gloves, and hats. This would be perfect! I love the options available with EasyClosets! I would make-over my daughters closet. Her closet is used not only for her, but because we don’t have a linen closet and her room has the largest closet in the ENTIRE house, it also holds our towels, extra linens, and toiletries. The system I use not just is not cutting it! I like the website where you can design & picture the closet layout to maximize usage. I love how neat and organized these closets are from easy closet! We just bought our house last year and I would love to make over a few closets, but if I had to pick one I would start with the nursery closet. Wow! Amazingly organized and so efficient. So neat and tidy. Definitely would have to say I would love to transform the closet in my 20 month old’ daughter’s room when we get it finished. I love that you can customize the set up for what works for you and your needs. I love how you can design it online and see what it will look like. I will makeover my own closet if I win. I want to make my single closet it a space for all of my things. I am also thinking about making one of my double closets into an office! This would help me do both! I love that it’s so customizable! We live in an older house and there really is no place for our dressers in our bedroom, so something like this in our closet would be amazing! I would use it in my craft room. It has limited space and needs a good, organized solution. Love the drawers you can get in the closet. Nice job. I love how it looks and can be customized to your space. I need to do the closet for my 2 girls who share a room. But my closet could use some serious help! I love EasyClosets. We’ve used them for all of our closets, but we are saving the best for last – our master closet. If I won, that would be the closet that we would do. I like the ease of installation and I would love to organize our master closet. I love the versatility of EasyClosets! I would re-do my teenage son’s closet (sounds weird, I know). He is a golfer, skater, loves to draw, and loves clothes – so I have never been able to organize his closet! There is never enough space, something is always on the floor – it’s awful. My daughter’s closet is much more manageable – definitely – my son needs it the most – or should I say, I need it the most for my son? Thanks! It’s awesome you can customize & my master closet is patiently waiting…. I Loved your girls closet and the versatility that it has to change as you need it to! I would makeover my Master closet as my daughter is having to move back home and we will be sharing my closet. It would be a really great time to win this. Thanks so much. Love the endless options and would most likely do the master closet. I love this company! We just bought a new home, and decided to take one of the smaller bedrooms so my husband and I can our own bathroom separate from the kids. But the bedroom is so small that our dressers are definitely not fitting well. A well designed closet would help soooo much in providing usable storage space! I love the flexibility if their systems!!! I’m having our first child August 1st and I need to re-do the baby’s closet to make it more functionable!!! I’ve been playing around with their design tool and this world work just perfectly!!! Fingers crossed we win!!! I’ve been looking at closet organization/design systems for a long time and this is by far the nicest and easiest to use! The price is pretty darn great also! Thanks for introducing me to Easy Closets and I would LOVE to win this prize! I would probably start with my own closet, but we have another three that would benefit from it also! We are downsizing by 50% mid-June. I would love to make the pantry space more efficient and add some organization to my new closet as well! I have been doing a declutter challenge, This is the exact thing i need for our bedroom closets, I love finally seeing the floor in the closet, this would so help it stay that way and help keep my bedroom clean as well. I would love to redo my bedroom closets!! I like that it’s super easy to install. I would love to redo my daughters closet if I win. Thanks for the giveaway!!! I love this! A great way to maximize small spaces. It would be great to have a real closet in my master bedroom! Currently I have a hole where the closet is supposed to be with just a dresser stuck in it. This would be a perfect solution! It is awesome to see how this solution works when you have kids sharing the same room. My two kids share and the closets and storage solutions are our only trouble when it comes to sharing. It is great to see a beautiful solution! The easy closets look so neat and pretty . I have been on a mission to organize my life and house . Would love this in my master walk in . I love how easy it is to install! I would definitely put it in my bedroom closet. I would do my closet. Love the sleek clean look and that it’s adjustable and customizable to fit the closet and your needs. Looks awesome!! I need to do something with my kids’ closet!! It’s just a very poorly organized closet and it looks like it would have plenty of room but storage and organization are not a function!! Lol, thanks!! That I would LOVE to organize. I love the diversity. The shelves, plus rod and drawers. I recently took the sliding doors off my daughter’s closet and am looking to install a closet organizer which I know is going to cost quite a bit of money so I hope I’m the lucky winner! I would like to win the closet makeover to use on the closet in my craft room. This seems like it would be the perfect way to get the organization that I need and make the space more usable. These designs are all great!!! I would like to give my teen age (13) daughter a makeover in her closet. She loves to have everything organize. I LOVE that these are fully personalized and changeable! My two boys share a closet and should I win I willl make it more accessible for them to reach their own clothes! We just bought a new house and we would LOVE to redo our master closest. Love how your closest came out. Very nice. Ahh! Beautiful! I would finally make use of all the space in our master bedroom! Love the closet designs, I need to redo my daughters closet!! I love that EasyClosets look customized but are super versatile. I am so lost in my closet…purses falling on my head, stumbling over my 30 pr of shoes…this is awesome! It would double my usable space…thanks for all the great ideas! I love the clean, crisp, uniform look it gives. I would definitely organize my master closet if I won. Love the use of space! I need to do both of my boys closets…there rooms are small so I would like to get rid of dressers to fit desks. Pick me pick me! My husband and I blended two families and two houses into one. Our master bedroom is a disaster when it comes to organization. I would LOVE to finally feel like I fit. I love the ability to customize it to your needs, and the price is great too! Would love to organize my bedroom closet with this system. I love the organized clean look of the closet and the absolute ease of installation!! The price is just a perk. I would love to be able to redo my daughters closet. She is the best mom ever and very busy so she does for everyone and is the last on the list. I would update my grandkids room. They have so many clothes and toys in there! I could really use this in my home. I love how customizable they are and that you can change it around in the future. I would be selfish and do our bedroom closet! EasyClosets prices seem pretty reasonable. You can’t really put a price on good organization! I’d redo my entry coat closet, make it more useable! I really like the online design tool. It is so user friendly. Then to have someone to help me out with suggestions is even better! I am not sure which closet I would use $1000 organizing. I have 3 that really need it – my girls’ closet as they are sharing a room, the closet that hubby and I share which was terribly laid out when the house was built and we have just survived with it, or my office closet which we use for homeschooling supplies, craft supplies and misc junk! I would love to win the EasyClosets makeover! It would be used in my master closet. There’s so little space and so much that needs to be in there. It’s a mess! My favorite thing about EasyClosets is that it’s done online using your specific measurements and you can see how it will look in the end. No going from store to store looking for something that will fit; no buying separate pieces online and hoping it will all work together. I’m also impressed with the quality of the unit. I would love to organize my daughter’s closet. It is a small closet and needs organized very bad!! I love the idea of creating the closet organizer online so you can see exactly how it will look and function!! My hubby has more clothes than I do and one of these organizers would be great for his clothes in our closet! Every closet in my house is a mess. The buyers of our last house needed us out in 3 weeks. We literally threw everything into this house. I’d love to re-do my daughter’s closet. We have such a tough time keep on it under control. Your girls’ closet looks great! The thing I like best about Easy Closets the online design tool and the overall organization they give you- it makes life simpler! I would do my master closet. It is pretty small and could really use a make over- it doesn’t give my husband and I much room and could be organized so much better. Thank you! I love these closets solutions. I have already used their design tool for my master bedroom closet. I have been trying to figure out how to redesign my closet for easier use and this would be the ideal solution. Thanks so much for sharing this. I am impressed with how the system can be easily customized for any desired space. I think I would either do the closet in one of the spare rooms or the bathroom. I would love to get all closets organized but would start with the master closet. I’ve always liked the look of these closets..it would be amazing to have!!! Fantastic! I’d love to win this and pay it forward to my husband. He has been going through some tough times lately with his health and this would be a great way to cheer him up. His closet would really be thankful too, it could really use some major organizing help from Easy Closets. Thank you for always sharing your fantastic ideas and fabulous giveaways, just hope my husband wins now! What a great company! They make it look easy with their online service. How neat to customize everything to fit perfectly to your exact dimensions. This would be a great help with my odd shaped master bedroom closet! I love the idea of adding more drawers to your closet and saving money by not buying a dresser. Less clutter in the bedroom. My daughter needs a new bedroom set. If I won I would use the closet system for her. Then only buy a bed. No need for a dresser. I would love to get something like this for my son’s closet. It is the smallest closet in our house, and we’ve had problems with a good “layout” for it. This would be a wonderful way to organize and make it more functional! I love the look of these closets and the fact that we can do them ourselves! We are in the process of turning a spare bedroom into a walk-in closet! Would LOVE to win this and put towards our makeover!!!! I love for the fact that Easyclosets turns your normal average everyday boring closet into something spectacular! I love how easy it is to use and that it gives you an idea of what the layout would look like. They are so versatile and “easy”! I would love to do my son’s closet since one half is stuffed with coats, motorcycle riding gear and the vacuum. Poor kid! I love that EasyClosets maximizes so much space! I have a square closet in my bedroom with two curtain rods that I would have done. It is so big and deep, it is hard to maximize space without simply putting in plastic totes and a small plastic dresser. I am a professional organizer and obtaining this would allow me to try out this company and recommend it to my clients! I love this EasyClosets tool! I would love to organize my master bedroom closet. The previous owners took about 1/3 of it for built in chest of drawers, so my husband and I don’t have much room in terms of closet space. I love that it is so customizable – not a prepackaged kit that might or might not fit my needs. I would makeover my master closet. It has wire shelves and does not use space well. I love the organized space. I would use it for the shares closet of my three sons. That tool is amazingly simple to use! I love how you can change features so easily. Would love to utilize this on all 4 of my closets! Easy closets simply the best!! Love my closets!! I love how “clean” the girls’ closet looks now! Beautifully organized and pretty, too! All the space for organizing!!! I need it so badly. Love the closet make over. I would love to makeover my clothes closet in my bedroom!! I love how organized it looks. I would love to redo my closet. Love the transformation. I need to transform my master closet. It is a very odd shape and could use help transforming it. It would be great to have help to figure out my odd closet shape. I love the way you can design your own closet. That is a great feature and the price is great too. I would make over my closet. Thanks for the giveaway. Good luck everyone. I love that they are so easy to customize and change at a later date. I would update my closet to increase the storage capability! My closets are very small reach ins, so I may be able to do all 3 for this price! I would definitely do ours in the master, as well as the one in the room for our baby we are adopting! It is wonderful how they can adjust as my kids get older! We bought a total mcm fixer upper we’ve done a lot to the house but have you seen the size of 60’s bedrooms? We could totally use this in the master closet! Once again Thank you for sharing your lovely home, ideas and tips. I haven’t checked in lately but I am glad I did today. You never disappoint. Love the closet! Keep up the good work! I would love to redo my daughter’s closet. She has retrofitted duct work in her closet and it makes it very difficult to store items in her closet. These Easy Closets would improve the usage of the space and help declutter her room. I love that I could customize her closet to the awkward space she has available. I like that it’s easy to design and can change as needed! A great investment! We’re getting ready to move to an older home so the closets are smaller. I would definitely make over our master closet since there’s 2 of us having to share that one small closet! Help! I have a very unorganized daughter who has asked me for a system to help her. Her closet is the worst! I love how easy it is to customize and the variety of finishes they have. With 4 boys in one bedroom I definitely need this!!! Love the organization!! I need this for my linen closet!! I like that it doesn’t need to be permanent, if you want to change the design to provide more space or storage you have the option, which is good for me because I’m always second guessing and changing my mind. It will difficult to choose which closet I want to makeover! I love the versatality & uniqueness you can get with these closets! I’ll be doing a master closet renovation very soon! I love how Easy Closets can be reconfigured! I have 2 girls that share a closet and it is usually pretty frightening to walk in to. I would love to redo their closet! Love your closet makeover for the girls – I would love to makeover my entry closet into something I could use to store games, toys , crafts for the grands. It is just wasted space right now – Thank you! Love how streamlined and efficient it is. .. and how versatile later for revamping for another person. .love love love it. . I love anything organized! I would probably do my daughter’s closet also. I love how all of the space is useful…no wasted space:) I would love to do this to my closet…which I share with my husband! We could definitely use it! Thanks so much for sharing the ideas and connecting me with Easy Closets! Love the design tool online. My husband’s closet has awkward angles & space & has been need of a makeover since we moved in this house 4yrs ago. My 18 year old son’s closet is an Easy Closet, done years ago and it still looks brand new. I would be totally selfish and redo my master closet. It was built to withstand an earthquake…everything is permanently attached and nothing is adjustable. I would love for it to be exactly what I want. I would redo my pantry. It is crammed without any organization even after I organize it!! It would be great to have customizable selves and pull out baskets. I love how inexpensive and easy it is! As a single teacher, I do not have a lot of extra money and all home improvement projects fall to me, so Easy Closets is a perfect fit! Love the Easy Closet web site and the design help they offer. Their product looks great. I would love to use this for my basement family area closet to get it organized. I love the fact you can customize any closet you want. I would use it to organize my oldest daughters closet. Love the clean lines of Easy Closet. I would love to use this for my home office closet. Thanks! Can’t tell you how many times the rods have fallen in our closet. I have dreamed of being able to redo the closet without spending a fortune and being able to customize to fit our needs is a super bonus! Looks like Easy Closets will take care of both! With a preteen daughter and a 9 year old boy both of their closets could use an overhaul also. Think of all the time I can save by being able to find exactly what I am looking for and have a home for everything. Hoping I win! Love the fact that it is so easy to change as your needs change. My 3 girls share a small closet that needs help. I like that easy closets are just that, easy. I would absolutely makeover the closet that I share with my hubby. It’s not a bad size, just horribly designed. There’s not enough room for the clothing and accessories of two grown adults! PLEASE HELP!!! One of two…#1 is my little girls room. There are three girls in one room and one standard closet. Or #2 the closet in my big girls room. Two girls 11&12 and a standard closet. This transformation is so cool. I have been looking at various options to update all the closets in our house. I have 2 girls rooms, guest room and our master bedroom. So which to pick if I actually win???? Think I’d have to go with my oldest daughters room as she is a tween and this would be perfect to get her organized. Such a great contest! Thank you! My daughters share a room and it would be awsome to have this closet system to help keep them organized! The organization aspects of Easy Closet are amazing! I would love to have their help in my master bedroom closet! Your daughters’ closet looks wonderful! This would be great in our new house to really organize our sons closet and free up more floor space! 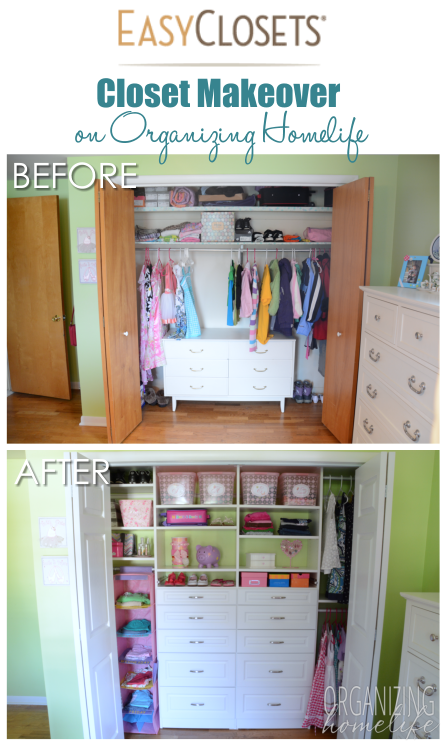 Our daughter’s closet could so use this closet makeover!! We have an older house with the one single place to hang everything. My favorite thing about these closets is the ability to adjust/grow with my daughter! I recently used Easy Closets to change my main floor laundry room into a mudroom. The best thing about was Lou, my designer. He was able to put vision on paper and make great suggestions to improve it. If I won this giveaway I would redo my master closet. I absolutely love how versatile the closet can be over the years to come for myself or once I have kids! I also love the sleek, organized, & stylish look it has!! Would love to do this to my master closet, as I desperately need the organization!! I would makeover the closets in my kids’ room. They are both in great need of being reorganized. I would LOVE to win this drawing. We’ve lived in our house for over two years and the master closet is severely lacking! This prize would be amazing! What I like best about them is all the different configurations and how easy it would be to personalize to your closet size, your lifestyle, and your needs! I love that the pieces can easily be maneuvered around. I would use this to organize my hall closet. I love that you can customize it and change it as your needs change! I love the layout you choose for your girls! I like that is it customizable, easy to install, and helps with organization. I would probably do mine and my husband’s closet as a surprise for the hubby. I love how the adjust so as your needs change so can the configuration. The best part is how well built they look from the pictures. Love the drawers and shelves! I love all the options to pick from! I love that there is something for everyone! I’d make over my bedroom closet – it’s filled with everything from pictures, to sewing items, to bags to purses to clothes. Stuff is everywhere — there’s no where to put it! The KID’s closet! Mine have a long closet that is shared with 2 rooms, a closet door in each room. It’s large, but not to easy to keep organized! I love the versatility. It really seems like this closet system can grow with your needs. I would redo the master closet. I am in desperate need of a system for my master bedroom closet. Right now, with one shelf and a bar I am having a hard time organizing everything. I love the flexibility this system gives you – a place for everything! I really like nooks and crannies for everything! I love the makeover of your girls’ closet space! If I won the drawing, I would use the prize to make over our master closet. Thanks! I love that there is a price point for every budget. I would choose something for our mudroom. That seems to be our most disorganized space in our house. I love that every space is utilized and yet still looks spacious and uncrowded. I would definitely organize the master closet. It needs some organization! The best thing about it is how much it can change your daily routine by everything being so organized! I have been playing with the design tool and live how easy it is to find exactly what you need for your space- no guessing!! I also love that I can figure what I want to spend and add or take away things to suit my budget!! This would be a dream come true for our master bedroom closet! I love how you can actually walk up to the hanging clothes in the closet with nothing on the floor- in my closet, I take a chance every day walking into it hoping I don’t trip on all the shoes. My husband and I have a small room with a dysfunctional closet, leaving us finding many different places and ways to store our clothes, which includes the closet of our soon to be baby. Its chaos. We would install this in our master bedroom closet. 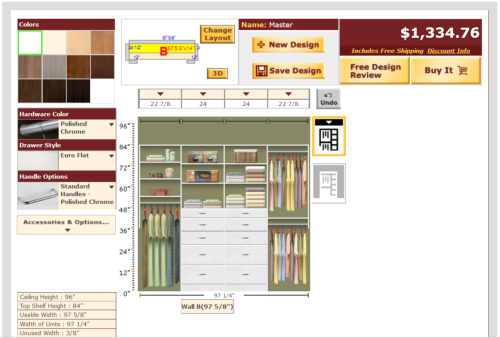 I love the ease of custom designing a closet with their software. How simple! If I won, I would use the system in my daughter’s room. I love how customizable and versitile these closet designs are! We are in the process of making my girls’ room more functional for both of them. We are pretty much finished other than the closet. They have a nice walk in closet with so much wasted space! We are trying to find a way to maximize every square inch of the closet since the room is so small. I have a 10 year old and 2 year old, so we need clothing spaces, toy storage, preteen must have storage and everything in between. The more we can utilize the closet, the more space they will have to play in their room. I would definately redo my closet…it is in major need of organization! Love how the closets look in your after pictures. I have two boys who are growing faster than I can keep up with them. Lots of organizing needs done in two very small closets. Unbelievable that you can accomplish so much in this space. I would love to make over my daughter’s closet. It is in very bad shape using a plastic bin to store things. This system looks wonderful and practical. How wonderful. I like that you can see how much everything costs as you’re “building” the closet you want with their program. What a neat resource to make sure you aren’t going over budget. If I won, we would like to re-do our master bedroom. We just had a baby and have been putting off organizing our room (as well as others) for months now. Seems easy to do! Would love to organize my daughter’s closet! I love to use their customizing tool even though it doesn’t like my closet dimensions but I improvise. I like the look and that it seems easy to put together. Easy Closets are gorgeous but the thing I like most of all is how easy it makes keeping organized! I love this closet! What an easy way to teach children organization at an early age. I would like to organize my husband and my closet. It needs lots of help. I like how this product gives everything in the closet a designated place. I would defiantly need help with my shoe and accessory closet. Beautiful redo! I love the soft close drawers, and the easy to understand directions. Our master closet needs a major overhaul. Would love an easy closet makeover! I would makeover my kids’ closet 🙂 that would be such a blessing to win!! I love how easy it looks to organize things! I love how easy it looks to install. My children’s room needs this! My eyes tell me I would LOVE this! Organized and beautiful, who could ask for more? Great product, please send it ASAP. I love how easy it is to customize, but the fact that they start you off with a design is the most helpful. I used their design software for our master bedroom closet and they came up with something I would have never thought of! I would love to put their design to use in our bedroom! I love the design tool. Looks so easy. I think I would re-do the master bedroom for my mother. She needs it. I love how customizable the closets are – so that each room in the house can have what works for that person. I would defiantly do my closet (first!) because I am sure we would then need to do ALL of them!!! This looks to be easy to install! Something I definitely need….I will make over my master closet since I am widowed, I need a change! Love all the options! Would love to do my closet. I like how it gives a closet organization, which I am horrible with. I want to do my closet because it is oddly shaped and I know I am not making good use of the space. I love how easy is to design with EasyClosets. The choices of closets are great ! The accessories make life easier, like the belt rack, laundry baskets and iron board. I would love to get a system for my master bedroom walk in closet ! I like their options for laundry and pantry. Since my laundry and pantry shall a space the size of a closet, I would choose this to for my makeover. Thanks for the opportunity! Your makeover in the girls’ room looks great! I have always loved the idea of having customized closets and the online tool is a great way to see (and get) exactly what you want. I would love to have this in my bedroom closet. I like the clean look and the easy way it goes together. Would love to redo my daughter’s closet. Thanks for the great give away and fab tutorial. Unfortunately, we do not much closet space in our house. Therefore, my teenage daughters closet is used to store her items plus other household items. This would certainly provide additional space and enable her to become more organized! No more excuses that she can’t keep her room organized since I’m using up her closet space!!! We ssssoooo need this! I am constantly trying to organize our childrens’ closets (my sons share a closet) and can never get it just right! It’s a major frustration for me and could use some professional help 🙂 thank you so much for this giveaway! A spot for everything. I would definitely redo my closet. It is just one big rod on one side.